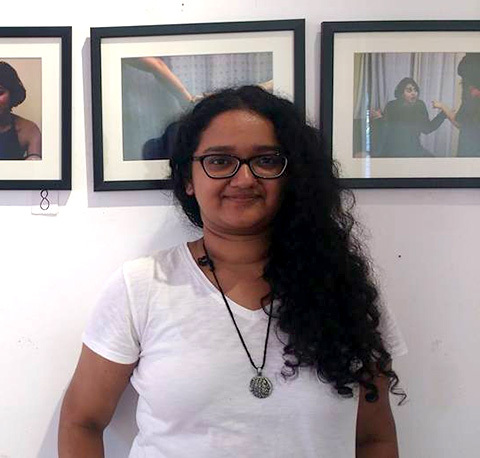 A photograph from a series by Revathy V K, exhibited as part of the ‘Homomorphism’ exhibition at Durbar Hall Art Gallery in Cochin late last year. Could you tell us about what inspired your photographic series and how you started working on it? I started with wanting to show a photo story of two women falling out of love, an aspect of relationships that I wanted to magnify and observe. I thought it would be interesting to capture the many phases a queer couple goes through in the process of heartbreak or falling out of love. While I was very drawn to the theme, I wanted to avoid any cliché and still be able to relay the emotional violence of people falling apart, which is not just specific to my queer protagonists but is a universal human experience. This photographic project was also my attempt at trying something new artistically, which is to venture into more private spaces of intimacy, or between two people, while I have previously only documented interactions in a public context. The exhibition at Durbar Hall Art Gallery was instrumentalised by Queerala, a L.G.B.T. support group in Kerala. It’s great to see such initiatives meeting with success. Keeping in mind your involvement with the queer activism and experiences of being a part of such an exhibition, what according to you could possibly be improved with regards to our efforts at integrating the community? I have always liked being in a space where I get to listen to stories by queer people and I also find that inspiring as a creative person. I have realised that the task at integration should take a form and shape that permeates through rural and urban spaces. I think it’s important for us as a community to be receptive of criticism to further dialogue. A common problem with queer activism is taking the role of a speaker and always expecting the others to be the listeners, and that makes me so mad. We need to speak about how rarely queer spaces are trans-inclusive, about phobia within the community or of N.G.O.s pocketing money in the name of helping out poor queer persons. I think the most important responsibility for us as with any form of activism is to be humane and reflective, of our actions and also of the community as a whole. You have been working on a collection of short stories in Malayalam that also has themes of desire, growing up in Kerala, and also mental illness. What has influenced you to write these stories? I think as a writer, I am mostly influenced by the part-jest, part-joust conversations I have with my friends, the Malayalam movies we watched while growing up, and the family structures we were/ are surrounded by. I am also interested in capturing how our physical spaces of socialisation are such important factors in the way conversations about our identities take place. I love how back home in Thrisshur, the primary place to socialise is the ground around Vadakkumnathan temple; there are people playing chess and cards, chitchatting under the trees. While speaking of writing itself, I think I didn’t anticipate how anxiety-ridden the process of writing would turn out to be, or how many times I’d rework a piece; and reading has been the much needed salve. In terms of literary inspirations, I like authors who play around with structure and suffuse their language with the dialect and mannerisms of the region they belong to. The list of classical writers I go back to includes the usual suspects that most Malayalis grow up reading: Vaikom Mohammed Basheer, Malayattoor Ramakrishnan, Kumaran Aashaan, Sarah Joseph, and O. V. Vijayan. Reflection is such an integral part of any creative pursuit. When you look back, how do you think you have grown as a writer? How does it manifest in your creative process? I think I used to be extremely obsessive about every aspect of a story; and end up trashing it or tearing it apart. Now, I am kinder to myself. I am reworking story skeletons from three years ago with a lot more care and less derision. I don’t care too much about how I sound, or whether it will ‘work’. I trust my voice a little more. As long as I resolve it in my head and put it down, nothing else matters. It feels like a privilege to even be able to complete a story. I work with content for a living and I have the advantage of being bombarded by fantastic written, visual, and auditory content. All of that translates to me knowing exactly what I want to do with my own stories, and I am scribbling and storyboarding constantly. While we are speaking of literature and also looking at the representations of the Indian lesbian, I feel that the domestic novel always uses lesbian desire to route the deep-seated inequities of heterosexual marriage for mostly middle-class women, but barely ventures into looking beyond this class divide. Are there any instances where you think a more inclusive picture has been attempted? In my humble opinion, I don’t think there are many literary texts to go to in India that are more representational in terms of portraying characters that are not upper-caste and middle-class. When it comes to storytelling, I would like to say the movie Velutha Rathrikal broke through that bracket and maybe more voices would be heard if we didn’t drown them out already or push them away with our facade of ‘inclusivity’. This movie portrayed a beautiful queer, tribal character, her relationship with another woman and her life, without resorting to any convenient tropes. I think a reason for our partial representation of queer characters is because we lead double lives, even while writing fiction. There is self-censorship because the fear of being harmed is a significant and justifiable concern. Inclusivity cannot be attained if we don’t venture into smaller cities, into rural parts of our country and engage with the prevalent politics, or attempt to understand how privilege works within our own social circles in the cities. It’s important for us, as artists/ activists to let go of our ‘saviour’ badge and be able to understand the social climate of these spaces. We have to find a way to acknowledge rural social traditions and offer support without patronising their struggles or beliefs. Abhishek is a visual artist who works with photographs, literature, and new media. You can find him at this location and send him music recommendations. By Jaideep Unudurti · In conversation with acclaimed artist Eddie Campbell, best known as the co-creator and publisher of seminal graphic novel From Hell.